Do you need professional painters to work on at least one of your units in the hospitality industry? With more than ten years worth of experience in the painting industry, Pete’s Professional Painting & power Washing has the experience and knowledge required to offer painting services without disrupting your services, staff or even guests. Various studies have proven that certain colors such as green, blue, silver and yellow can foster better sleep. With the right color on your hotel or resort walls, your customers won’t just get better sleep but also enjoy their stay. Our professional painters handle various types of painting projects in the commercial industry, ranging from facelifts of multiple buildings to refurbishment of single units. 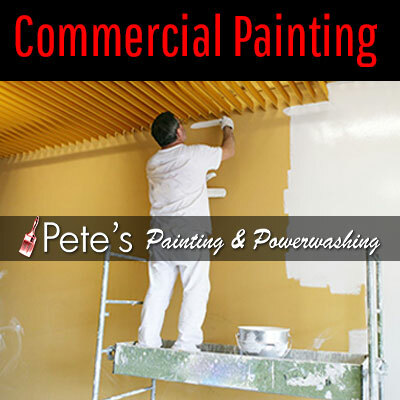 Whether your project is simple, complex or easy, experts at Pete’s Professional Painting & Power Washing get on site on time and work within the established budget to complete your painting project on time without leaving a mess behind- we guarantee you a clean workspace once we leave your premises. Our premium professional painting services for your commercial space in the hospitality industry are aimed at revamping your space, ending with an intensive and thorough cleaning process. When it comes to painting projects in the hospitality industry, we are the go-to professional painters for most businesses.